Taus Makhacheva. Tightrope (video still), 2015. Courtesy Lawrie Shabibi and the artist. Before the wonder of the sun—I burn. Blossoms walk in my shadow. Lawrie Shabibi is delighted to announce But Still Tomorrow Builds into My Face, a group show curated by Nat Muller. The exhibition takes on a timely topic: the disappearance and loss of cultural and other types of heritage. The works explore the relationship between collecting, power, history, conflict and identity. By removing subjects from the jaws of time and permanent loss, and by fixing them in memory, they become poetic and political acts of preservation. In her series of wall rubbings, “Archive of Tunis Banalities” Nadia Kaabi-Linke acts like an archeologist uncovering a specific urban memory, bringing the streets of Tunis, prior to the 2011 uprisings, into the gallery space. In Persijn Broersen & Margit Lukács’ ghostly, yet ornamental video, the flattened motif of 18th century illustrations of the ruins of Palmyra are brought to life as if they were liquid. Created before the destruction of Palmyra by ISIS, the violence of the present overshadows the past and the artists’ intent. Shahpour Pouyan’s sculpture of the tomb of the 11th century Muqarnas dome of Sharaf ad-Dawla, a Shi’ite mausoleum near Mosul, recently destroyed by ISIS, is another example of a site lost. Long-fascinated by its shape, and hoping he would one day visit it, Pouyan kept an image of it pinned to his desk. His sculpture thus is a preservation of an image, a memorial to a gone monument. The violence, but also poetics, of loss and absence run consistently through the exhibition. This seemingly contradictory dynamic is well illustrated in the works by Palestinian artist Yazan Khalili and those of Lebanese artist Daniele Genadry. In his series of photographs The Day we Saw Nothing In Front of Us Khalili has taken images of the landscape in the Palestinian occupied territories in which he has scratched out the Israeli settlements on the horizon, revealing an image in which violence can be enacted upon the violence depicted. Genadry’s screenprints on mylar are based on landscape photographs taken over the course of ten years from the same town in Mount Lebanon. These ephemeral-looking pieces have a sensibility of the durational while being fleeting at the same time. They question what seeing and not seeing might actually mean. Finally, in her video Tightrope Dagestani artist Taus Makhacheva continues her querying of the production of history in the post-Soviet era. 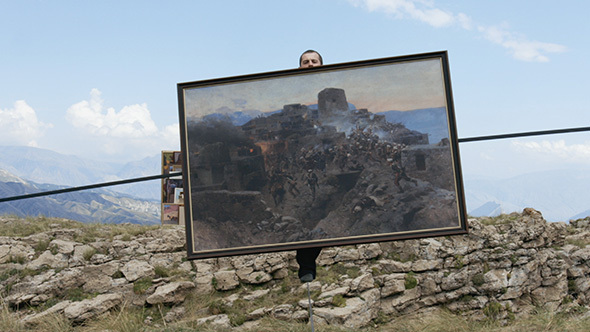 A tightrope walker crosses the abyss of a canyon in the highlands of the Caucasus’ mountains transporting artworks of various Dagestani artists. This balancing act highlights how art history is threatened by amnesia and how an equilibrium can be found between the fragile balance of post-Soviet subjectivity and a traditional, national and contemporary narrative. Moreover, as with all the works in the exhibition But Still Tomorrow Builds into My Face, it asks what the role and the position of the artist is in these tumultuous times.